Presenting 9 outstanding Australian physique champions from the late 60s to the 70s in this historic and very rare feature. Includes John Terilli. See more of the best known names on the Australian Bodybuilding scene from the Seventies. This is Aussie Muscle of the ’70s Volume 2. Presenting 9 outstanding Australian physique champions from the late 60s to the 70s in this historic and very rare feature. Shot on film, and digitally transferred to DVD with background music added. Includes some gym workout, oiling, pumping, tensing and lots of posing, both on the beach and in the studio and some on stage. Where ever possible when big arms are on offer – we show lots of great closeups on these huge, flexing 20″ arms. Roger Walker and John Terilli both competed in the Mr. Olympia and others won Mr. Universe and National titles. This DVD also includes the only known footage of GMV’s own Wayne Gallasch, posing when he was Mr. South Australia way back in 1968. Click here for the HUGE PHOTO GALLERY. Starting on the beach, John pumps his ripped biceps with the help of a partner then launches into some pushups for his triceps. More pumping and tensing, sweat and oil dripping as John pumps to the max before launching into his posing routine followed by closeups on his legs as he tenses and displays them for the camera. Next it is more upper body posing in closeup with emphasis on the arms. John, a Sydney gym owner, has had a great career both with the IFBB and NABBA. He won the NABBA Pro Mr Universe title in 1994. The segment commences in the studio with Roger hitting his signature most muscular pose before moving into his posing routine. Roger had a huge V-shape complimenting his 21″ arms which he now pumps and poses in full-screen closeup framing that is mind blowing. He displays the great peak of the biceps and the separation and condition at this shoot, just before Roger won the Heavyweight Class in the 1976 IFBB Mr. Universe. It is an in-depth arm and back posing display followed by chest and shoulders in closeup tensing. The scene then moves to outdoor posing in a park, with full body and closeup framing. Sam’s illustrious career has extended from his beginnings as a Junior Champion to being a present day Masters Champion. In this film a very young Sammy starts out pumping with DBs in the studio. Next it is into the arm posing in closeup scenes with a shredded Sammy turning it on. Chest closeups and most muscular poses follow and then Sammy’s complete posing routine, followed by leg tensing and posing plus more upper body posing. Sammy’s segment concludes with his posing on the contest stage on the next day. He is an outstanding poser in the classic style. He runs a well known gym in Melbourne, Victoria. A young and tanned Eddie Turner is out doors in a garden in Adelaide, South Australia where he starts out oiling and pumping for his film session with Wayne. Eddie had just won a state title and his outstanding abs and ripped condition were prominently displayed. Biceps and triceps are pumped with DBs, followed by calf pumping and some upper body tensing and flexing. Eddie then gets up on top of the posing wall for a relaxed pose before going back to the safety of the lawn to show us his winning contest routine in both full body and closeup posing. The location changes to the nearby West Beach for some more arm tensing and posing with more great closeups before Eddie walks off into the surf. Paul shows us his biceps workout, starting out pumping up in the gym with some heavy barbell curls, done seated and standing. He is also in outstanding shape as he displays his mature and quite outstanding physique and huge 20″ arms. Next we see concentration curls as Paul pumps his arms to the max. To finish the biceps work Paul does some bent over barbell concentration curls. This is followed by chins followed by some Scott preacher curls. The whole segment is crisp, well lit and very clear photography when you consider the technology of the day. Finally Paul shows us his posing routine at a Frank Burwash contest in Melbourne which we believe was in 1974. The intensity of his posing display and great condition was greatly appreciated by the sellout audience. 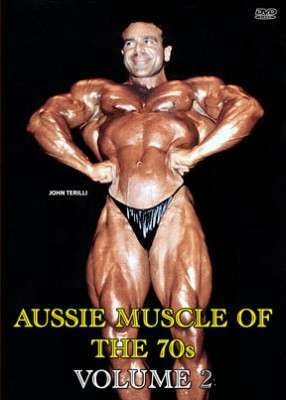 Paul placed 2nd in the 1972 Mr. Australia and in the 1972 IFBB Southern Hemisphere Mr Universe. He was also the promoter of the 1980 Mr. Olympia contest won by Arnold. GMV’s own Wayne Gallasch handed over his Super 8 film camera to a training friend to record this rare posing sequence on an Adelaide beach in March of 1968, 6 months out from his victory at the South Australian State Bodybuilding Championships. Wayne took up the movie camera and still camera when he started GMV in 1966. This is the only film footage that exists from his bodybuilding and powerlifting competition days. Posing on a rocky reef in the ocean at O’sullivan Beach, Wayne moves straight into his contest posing routine, displaying a great V-shape, good leg development and a very symmetrical overall physique. Kneeling poses are also included as Wayne’s winning physique is displayed from all angles. The scene shifts from the reef to the warm sands of the beach as Wayne, with his main training partner Warren Scanlon on the left, plus Joe and Mario Vozzo take turns to hit compulsory poses, side by side. Next to pose solo at the reef is Mario Vozzo, followed by his brother Joe and finally Warren Scanlon does some upper body poses. Frank and George help each other pumpup in their room on the Gold Coast, on the day before Frank won the 1972 IFBB Southern Hemisphere Mr Universe. They were 2 of the top physiques in Australia in the early 70s. Frank, in superb condition, shows us his contest posing routine, and he is joined by George for a duo posing display. Now it’s time for Frank to do his solo pumping and posing highlighting his arms and peaked biceps in closeup. Billy is a 3 time Mr. Australia winner noted for his shape, size and symmetry. See his contest history below. This segment starts with a ripped Billy posing in the studio, with emphasis on upper body posing, then extreme closeups on arms and abs. More flexing of peaked biceps rounds out this great DVD on the champions of Australian bodybuilding of the seventies. Camerawork in this segment, Paul Graham’s and several other segments by Robert Nailon. All other camerawork by Wayne Gallasch.